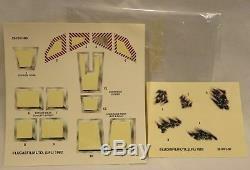 This listing is for one Snowspeeder Vehicle with figures, box, instructions, and sticker sheets from Kenner. 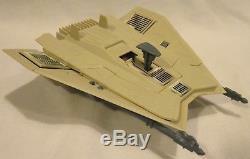 This vehicle is from the Star Wars Micro Collection. It was only available near the Christmas 1982 holiday season and then the Micro Collection was cancelled. 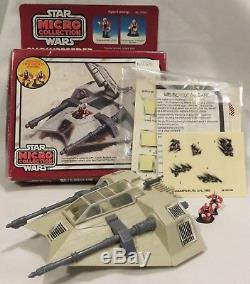 This is one of the rarest items in the Micro Collection (probably the second rarest after the Millennium Falcon). 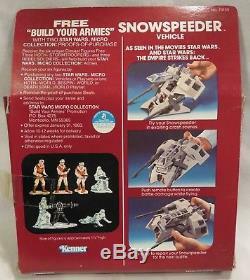 Included in this listing are: one Snowspeeder vehicle with crash feature, one diecast Snowspeeder Pilot figure, one diecast Snowspeeder Harpoon Gunner figure, original box, assembly instructions, unused battle damage sticker sheet, and used normal sticker sheet. Please note the diecast figures are the 1.25 scale figures that are standard with the Micro Collection. 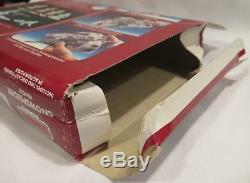 This listing does not include the original internal packaging materials of the box or the Kenner toy catalog. See the Condition section for more details. All parts are original Kenner products no fakes or substitutions. Snowspeeder Vehicle + Box + instructions + stickers. From the Official Star Wars Web Site. 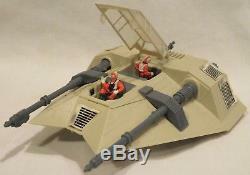 Snowspeeder: This was actually a JC Penney exclusive. The T-47 was offered in a somewhat larger box that features the two figures: a snowspeeder pilot and a snowspeeder harpoon gunner. 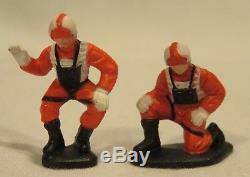 Both figures seem to be standing, but they fit into the speeder. The speeder features a retractable landing gear, an opening cockpit and a rotating harpoon. Just like with the X-wing and the TIE fighter, the snowspeeder can crash or become damaged by pushing a button. 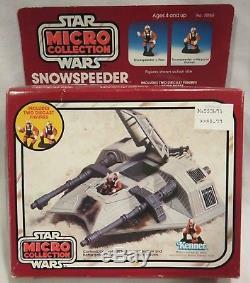 The snowspeeder is well made, but it is too large compared to the figures of the Micro Collection line. 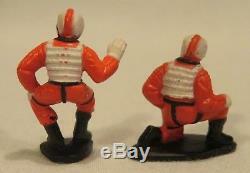 Since this set was only available near Christmas 1982 at JC Penney, its one of the rarest Micro Collection toys. This has been part of my Star Wars collection since I was a kid. It was opened and played with for many years. The vehicle is still in overall very good condition. Some of the stickers are peeling and you can decide how best to deal with those. It can use a detailed cleaning. The button that triggers that crash feature works well as can be seen in the photos. The landing gear works and easily moves up and down. The 2 diecast figures are in excellent condition, still maintaining good paint color and coverage. There are some minor chips in the paint as can be seen in the pictures. The stickers on the vehicle were applied when I was 11 so they are not perfectly straight but they still look good. I only applied the normal or clean stickers. The empty clean sticker sheet is included. The battle damage stickers are still on the original sheet. The instruction book has been kept in the original plastic bag, so it still looks good. The black and white printing is clear and there is very little aging. The original box has been banged up over multiple moves to different cities but the colors still look great and the general shape is still intact. The original JC Penny price tag is still on the box as well. Overall, this vehicle and other contents are in excellent condition. Pictures are of the actual item you will receive. Item comes from a smoke-free and pet-free home. Feel free to ask me any questions. Im a collector too and I know how I want to receive things. Denver residents may pay in cash if picking up from me directly. 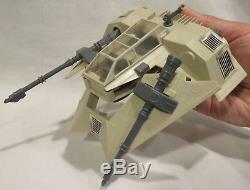 The item "Vintage Star Wars Micro Collection Snowspeeder, Instructions, Box, 1982 RARE" is in sale since Friday, September 7, 2018. This item is in the category "Toys & Hobbies\Action Figures\TV, Movie & Video Games". The seller is "run_david_run" and is located in Denver, Colorado. This item can be shipped to United States, Canada, United Kingdom, Denmark, Romania, Slovakia, Bulgaria, Czech republic, Finland, Hungary, Latvia, Lithuania, Malta, Estonia, Australia, Greece, Portugal, Cyprus, Slovenia, Japan, Sweden, South Korea, Indonesia, Taiwan, Thailand, Belgium, France, Hong Kong, Ireland, Netherlands, Poland, Spain, Italy, Germany, Austria, Israel, New Zealand, Philippines, Singapore, Switzerland, Norway, Saudi arabia, Ukraine, United arab emirates, Qatar, Kuwait, Bahrain, Croatia, Malaysia, Chile, Colombia, Costa rica, Panama, Trinidad and tobago, Guatemala, Honduras, Jamaica, Antigua and barbuda, Aruba, Belize, Dominica, Grenada, Saint kitts and nevis, Saint lucia, Montserrat, Turks and caicos islands, Barbados, Bangladesh, Bermuda, Brunei darussalam, Bolivia, Ecuador, Egypt, French guiana, Guernsey, Gibraltar, Guadeloupe, Iceland, Jersey, Jordan, Cambodia, Cayman islands, Liechtenstein, Sri lanka, Luxembourg, Monaco, Macao, Martinique, Maldives, Nicaragua, Oman, Pakistan, Paraguay, Reunion.